The session will go for a couple of hours and after that there will be an hour or two of Open Smithy available for those who wish to continue. We will have 16oz/24ga/~.022" Copper sheet and ~16ga/.057" mild steel available for purchase, or you can bring your own material (no lead, no galvanized or plated steel). 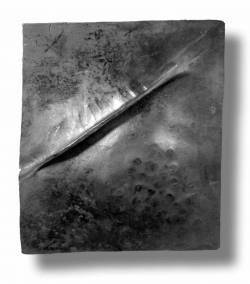 It is helpful if the student has attended a Fold Forming class either at Prospect Hill Forge or at Metalwerx, but it is not required. Doing some web research on Fold Forming would be a very good idea. Gift Certificates for Exploring Fold Forming are available. If you're interested in taking Exploring Fold Forming and it's not on the calendar, please tell us using our Waiting-List Page.